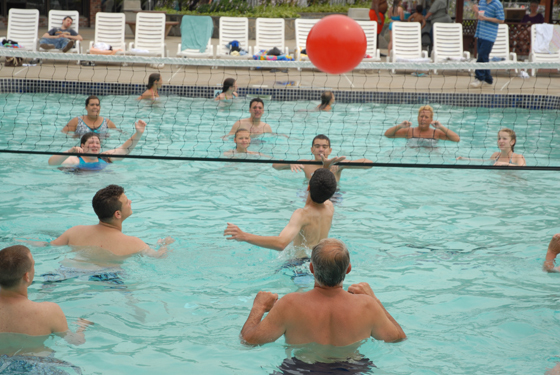 The volleyball net will be set up in the pool on Sunday evenings for pick-up water volleyball games. Balls will be available in the guard’s office. Sub in as room allows, or if we have lots of players, the winning team stays on after each game. Teams should mix up ages where possible, so that everyone has a chance to play. No refs; just play fair. A server has 5 seconds to make a legal serve or his team loses control of the ball. He may toss the ball and catch it if it is a bad throw, as long as he has not attempted to hit the ball over the net. The ball must clear the net and must fall in the water and between the out-of-bounds lines. If the ball hits the net but does not go over, it is an illegal serve and a point is awarded to the opposing team. If the ball hits the net but goes over to the other side, it is a legal ball and is considered in play. There are many rules having to do with the style of play in water volleyball. Each team can touch to ball only three times while the ball is on their side of the net. The ball may be hit by any part of a player's body, as long as the ball remains in motion at all times. A player may not hit the ball twice in succession or the play shall be called dead and the opposing team is awarded the point. No player is allowed to screen a member of the opposing team. Screening involves deliberately distracting or blocking the view of the ball by waving your arms in front of an opponent's face. Net fouls occur when and part of a player's body makes contact with the net. The ball and point are awarded to the opposing team if this happens. Illegal hits occur when the ball comes to a rest or makes too much contact with one player. This can include pushing the ball, rolling, lifting, catching, throwing or holding the ball.